I just want you all to know that it’s been wonderful reading all of your letters. I have so many I have quite a reading list that's piling up. It's okay, I don't mind having too much to read. If you all have questions, feel free to email me, I’d be happy to answer them. Today we hiked Camelback Mountain again, except this time it was on the other side, quite a different hike on the other side. Halfway up, my shoes started to bother the backs of my heels to the point where they were starting to cut into them. The cloth that separates the shoe mold from the foot had completely worn away so I made the rest of my hike in my socks. You should have seen the people's faces when they see my feet and realize I have no shoes on. Some of them look like, "My goodness! That guy is absolutely insane!" Honestly, it felt pretty good for the majority of the time but I put them back on for the last little bit so I could catch up. I tried to make an analogy from that relating shoes to sin and how they cut into you, but once you take them off through repentance, you are relived, but then I realized the shoes would be closer resembled to the armor of god, but that wouldn't dig into your feet so...I think I’ll scrap that one. Anyways, I love you all and hope you have a wonderful week! This week was the first week in a while we have really begun to see success. Still no baptisms, but we have got a couple really good people that we're reactivating and one investigating. Barry, who is a less active, served a mission many (20) years ago and kind of fell away many years back. We just recently got in contact with him and he's progressing at an amazing rate. I even got to teach him the most remarkable lesson we get to teach, Lesson 3. Really, when you're teaching this lesson (The Gospel of Jesus Christ) to an investigator, you've got to keep it simple and the way Preach My Gospel teaches it, or it'll go straight over their heads. With those who are familiar with the gospel, there are so many doctrinal points that you can go into that really make the lesson far more powerful (IE: Explaining more aspects of faith, delving into repentance, baptism, the Atonement and repentance all as one, the holy ghost, and ultimately what enduring to the end really means). It is, by far, my most favorite lesson to teach when I can really help them understand. It's kind of like teaching diving to a group of middle level swimmers (to use a swimming metaphor). We also went on a campout with our branch this last weekend. It was wonderful to see a few non-members there as well as a few less actives and many members from both the Mesa and Phoenix branches. One really cool experience happened there when two 11-year-old kids went missing. I, of course, blamed it on the mountain-dwelling, kid-snatching, cannibalistic hermits, but it turned out that the two of them went exploring and got lost. The girl, finding out that they were lost, turned to the boy, who is a nonmember, and asked if he had any words of wisdom. He turned back and said that he had none. They walked a bit further than the girl turned to the boy and said, we should say a prayer. The boy has like no idea what to do, and then the girl says, "You should offer it." After briefly teaching him how to pray, they pray together. They were found 10 minutes later by the police. A wonderful lesson about prayer for each and every one of us. Sorry I didn't write last week, it was a busy week, it was also transfers, and they wanted me to play a special musical number that they told me about five days before I need to play, so I have lots of practice before me. These last couple weeks have been quite interesting. I have had many unique events happened. 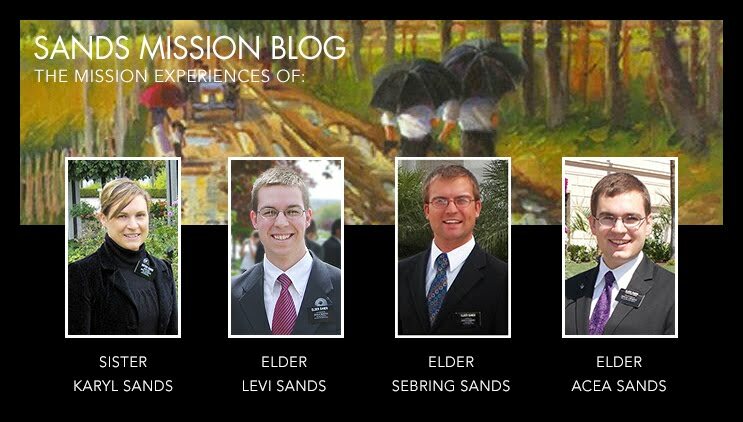 Besides the MTC, this is the first time in my mission that I'm no longer in a trio. I was with Elder Riggs for three weeks as well as Elder Burr but now Elder Riggs is home after completing his mission. It is now up to Elder Burr and myself to take care of the valley of the sun. So the work has been extremely successful lately, and our mission president has been really pushing us to change. It is come to the point where he wants us to report every single day, via text, about what we did that day. During the last few weeks our numbers did go down, but we are coming back now, and having several lessons and contacting many, many, many, many people. Unfortunately, we are still not having a ton of success. To make things worse…my previous bishop got a Windows Surface Pro and made a point of telling me about it. I am so totally jealous. A Couple weeks ago we logged over 10 hours of service during the week, which is an incredibly, insanely large amount. But, it was so enjoyable, it was nice to meet all those people to be able to serve them, the only damper was the 115° weather. One of the spiritual highlights that happened recently, was the opportunity for my companion and I to go to what is known as The Randolph Center. This is a center in Tucson that is a shelter/care facility/training center for the mentally and physically handicapped. We were all assigned one person to take care of/entertain for the time that we were there. It was church for the patients, but they called a primary because all of them were primary children who are under the age of accountability. It's quite interesting doctrine. I was assigned with the patient called Maria, who herself his deaf. She simply went up to the stage, put her hands on the piano, and felt the vibrations for the majority of the time. I didn't really get to communicate with her too much in the traditional way. I noticed what special spirits each and every one of them have. Some of them you almost can't tell through all of the equipment, handicaps, and inability to communicate, but you can always tell that they're there. You can always tell that they are a child of God and that they know who you are, however limited they may be physically. Some other interesting news: our zone was just combined with another zone causing the number of districts to rise from 2 to 4, one of those districts being incredibly large. Our zone meetings have just doubled in length and size and several of the companionships became hybrid language companionship's because the other zone was a Spanish zone so now we have several companionships that are one Elder English and the other Spanish. I don't know how that quite works out, but it's quite fun. I look forward to hearing from you all and have a wonderful week!